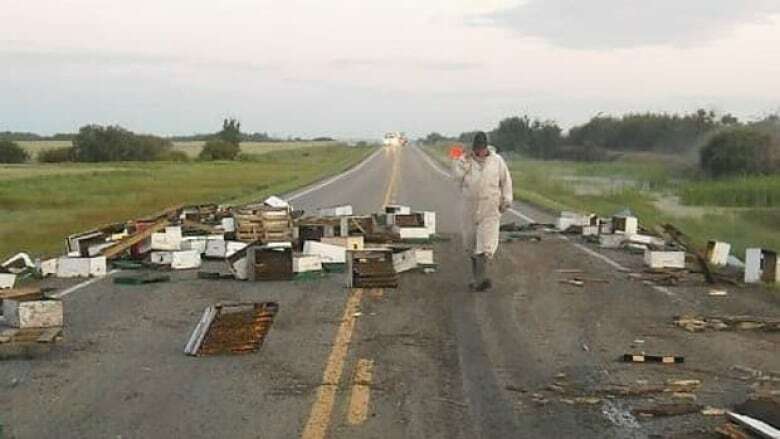 Police closed a rural Alberta highway Thursday morning after a truck carrying a shipment of honeybees skidded off the road, spilling its load. The truck was headed west on Highway 13 between Camrose and Killam, southeast of Edmonton, when the driver rolled the flatbed truck onto its side, strewing 104 beehives across the road. As bees swarmed the highway, RCMP rerouted traffic around the scene. However, the swarming bees made the cleanup all but impossible. When the beekeeper arrived on scene, he advised the fire department to spray the bees down with water and foam, knowing it would kill many of the bees, police said. The surviving hives were then loaded up onto two separate flatbed trucks and returned to their home. The driver of the flatbed truck was not seriously hurt.